These plays were contributed by Coach Gibson Pyper who I consider to be the best on the internet at breaking down the x’s and o’s of the NCAA and NBA. You can follow him on Twitter at @halfcourthoops and on his website at halfcourthoops.wordpress.com. The NBA playoffs is always my favorite time of the year. 16 teams battle it out to be crowned the NBA Champions in two thrilling months of great basketball. One of the most intriguing things to me are the plays that teams use. Some they’ve been using all season, some of them are made up on the spot by some of the smartest basketball minds in the game. 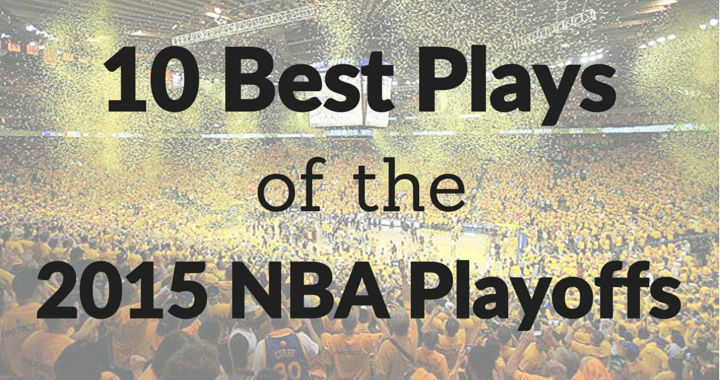 Either way, we see a ton of brilliant set plays every playoffs. 1. (2) exits to the wing. 2. (1) passes to (2) and cuts through the lane to the opposite wing. 3. (3) dives through to the opposite corner. 4. (2) passes to (5) at the top of the key. 5. (5) dribbles at (1) who cuts backdoor and the pass is made. 1. (3) down-screens for (5) and then clears to the weak-side corner. 2. (1) passes to (5) and cuts off him. 3. (5) fakes a dribble hand-off to (1). 4. (5) dribbles at (2) who cuts backdoor for a layup. 1. (4) and (5) set a double screen for (2) who curls through the lane. 2. 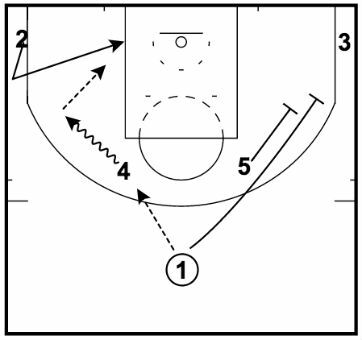 After (2) clears, (5) sets a flare screen for (4) to get a look for a three-pointer. 1. (1) comes off a pick-and-roll from (4) and passes to (5) in the post. 2. (2) cuts off (5) and receives the dribble hand-off to attack the rim. (2) has the option to pull up and shoot, attack them rim, or cut back-door if being overplayed. 1. (1) passes to (2) on the wing and then cuts off the UCLA cut set by (4). 2. (4) sets a ball-screen for (2). 3. (2) dribbles off and passes to (5) who has lifted to the three-point line. 4. Because Memphis hard hedges on pick-and-rolls, 4 is open on the roll. 1. (1) executes a dribble hand-off with (4) and then clears to the wing. 2. (5) sets a back-screen for (3) to receive the lob from (4). 3. If that’s not open, (4) passes to (5) who looks to pass to (2). 4. If (2) is being overplayed they cut backdoor for the layup. 5. If the backdoor cut isn’t open, (5) passes to (2). 6. (2) sets a shuffle screen for (4) for the layup. 1. Typically a dribble hand-off between (4) and (2). 2. This option is a backdoor cut by (2) for a layup. 1. (3) walks his man up the lane. (4) pops out and receives the pass from (1). 2. (3) sets his man up and cuts backdoor for a layup. 3. (5) sets a flare screen for (2) to keep weakside occupied and give the hammer option if defense helps. 1. 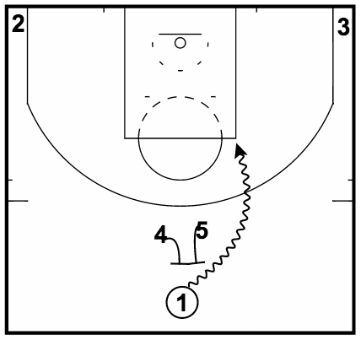 (4) and (5) set a double high ball-screen for (1). 2. The key is that both bigs are flat. Usually holding hands to not allow the defense to go under the ball-screen. 1. (2) sets a cross-screen for (3) who cuts to the wing. 2. (1) passes to (3). 3. (2) sets a back-screen for (4). 4. (3) passes to (4) for the layup.